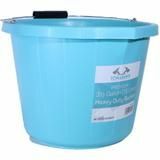 3-1/2 gallon pail is black and ideal for a wide variety of household applications. It has an attached handle for easy lifting and carrying. Reinforced upper rim for extra strength.